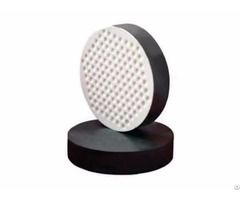 Pot bearing, also known as pot rubber bearing, with elastomeric bearing embedded inside of the steel plate, can be divided into fixed pot bearing, guided pot bearing and free sliding pot bearing. Pot bearings are special types of bridge bearings for taking large loads, large horizontal displacements and large rotation requirements in confined areas. 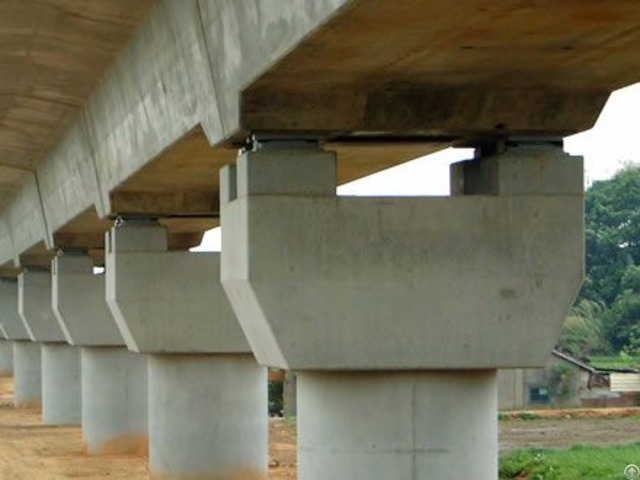 The loading capacity of elastomeric bearings is limited, while pot bearings solved this problem, thus pot bearings are often regarded as suitable for use when bridges need large bearing reactions. Fixed pot bearing is unmoved in all directions. 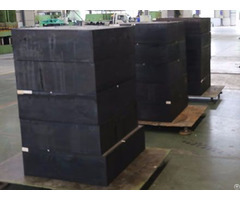 Under loads, the elastomeric bearing pad behaves likes an incompressible confined fluid which enables the rotations on any axis. Guided pot bearing with steel guide edge can be only moved in one direction. The stainless steel slide and PTFE slide further reduce the friction coefficient and guided pot bearing is used best when horizontal loads are relatively small (less than 20% of vertical Load). Free sliding pot bearing can be movable in all directions. The added PTFE and stainless steel sliding surface between the piston and the sole plate creates a bearing assembly that allows horizontal movement in any direction. Bearing capacity of the pot bearing is 100% of the design capacity and allow overloading 10%. When working temperature changes from -25 °C to + 60 °C, the minimum design friction coefficient of pot bearing is 0.03. When working temperature changes from -40 °C to + 60 °C, the minimum design friction coefficient of pot bearing is 0.06. The maximum rotation of pot bearing is 0.03 rad. Normal temperature type: -25 °C to + 60 °C. Cold resistance type: -40 °C to + 60 °C. With low-profile but high loading capability over 50, 000 kN than elastomeric bearing. 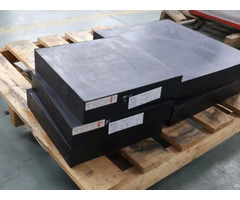 Shearing strength of elastomeric pad is increased through the method of encasing it in the steel pot. Allow for large rotations ranging from 0 to 0.03 rad. Low friction coefficient between 1% and 3%. All the metallic parts are protected against corrosion by galvanization and epoxy painting according to EN 1337-9 (also can be customized). Complying with EN 1337, DIN 4141, BS5400, AASHTO, SETRA, etc. Pot bearings are suitable for locations where low-profile, high-load bearing devices are required. And they are especially suited for curved or skewed bridges and other complex structures where the direction of rotation varies or cannot be precisely determined. When pot bearing is transported to the construction site, the components and packing list in the box should be checked. After passing the checkout, the pot bearing should be placed into the box again. When the pot bearing needs to be installed, then you can take it out. When unpacking the case, the PTFE plate and stainless steel plate should be well protected to avoid scratching and booty attaching. At the same time, 5201-2 silicone grease should be fully filled. The supporting padding stone should be set under the pot bearing and the strength grade of concrete should not less than C40. The height of supporting padding stone should consider the installation, maintenance and replacement of the pot bearing. Supporting padding stone and concrete on pier top should be equipped with corresponding reinforced mesh in according to the JTG D62-2004. The anchor holes should be preserved according to the anchoring sleeve's specifications and quantity. When installing the guided spherical bearing or free sliding spherical bearing, we should pay attention to check the PTFE sliding, and the main sliding direction of the PTFE sliding should be consistent with the bridge direction. The central line of the pot bearing and the main beam should be paralleled or coincided.